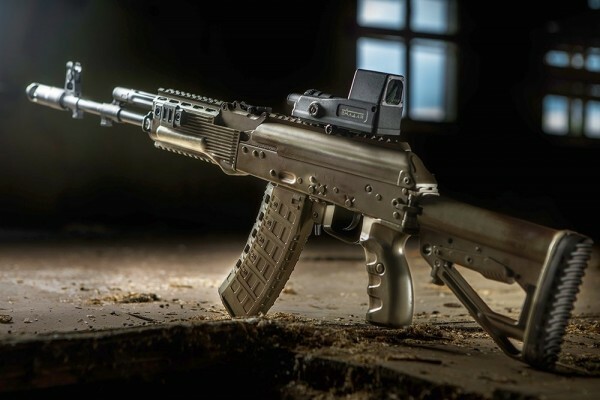 The AK-12 assault rifle has passed military field tests and meets all of the Russian armed forces’ design and operational standards, gunmaker Kalashnikov Concern says, according to Jane’s 360. The AK-12’s success in military trials sets it up to become the standard weapon for soldiers in Russia’s Ratnik — or Warrior — future weapon system. Work on the AK-12 began in 2011 with the AK-200 as a base model. Kalashnikov Concern presented prototypes in early 2012, and the first generation of the weapon was also successful in military tests. Read more . . .
Russia may deploy its military to police the borders of planned de-escalation zones in Syria within two to three weeks after finalizing an agreement with Turkey and Iran, Russian negotiator Alexander Lavrentyev said on Tuesday. Moscow hopes to sign the final documents with Ankara and Tehran on Wednesday, he told reporters after a series of meetings in the Kazakh capital, Astana. Read more . . . When they return from legislative recess next week, lawmakers will have only a few days to address financial problems with the Veterans Affairs Choice program before users start to see significant problems. Last month, in testimony before the Senate, VA Secretary David Shulkin warned lawmakers that money in the Choice program funds was being spent at a faster rate than officials expected, threatening to bankrupt the program before the end of the fiscal year. Available funds dropped from about $2 billion to less than $850 million in three months. Read more . . .
“The VA TBI Model System is uniquely positioned to inform policy about the health, mental health, socioeconomic, rehabilitation, and caregiver needs following TBI,” write Guest Editors Risa Nakase-Richardson, PhD, of James A. Haley Veterans’ Hospital, Tampa, Fla., and Lillian Stevens, PhD, of Hunter Holmes McGuire Veterans Affairs Medical Center, Richmond, Va. The special issue presents initial reports from a Department of Veterans Affairs (VA)-specific database of patients representing all traumatic brain injury (TBI) severity levels. The findings will play a critical role in VA’s efforts to meet the long-term needs of veterans with TBI. Read more . . .
June 27 is National PTSD Awareness Day, an opportunity to bring to light a disorder that affects millions of Americans every day. The distinction of this day was granted by the United States Senate in 2010. In 2014, the Senate upgraded the cause by designating the full month of June toward raising awareness for PTSD. These efforts are critical to providing opportunities to educate the public about PTSD and how it affects those with the disorder. Read more . . .
A study by the Consortium to Alleviate PTSD will test whether PTSD can be treated with electromagnetic pulses to the brain. The study, beginning this summer, will treat 100 military members and veterans with PTSD at the Laurel Ridge Treatment Center in San Antonio. There, a robot will guide an electromagnet pulse across each subject’s scalp during 20 days of treatment. If it seems like science fiction, the therapy, known as transcranial magnetic stimulation (TMS), has a genealogy going back all the way to Galvani’s frogs, said Peter Fox of UT Health, the study’s primary investigator. Read more . . .